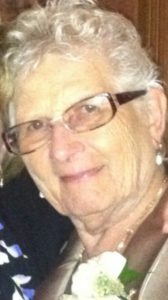 Jo Ann Bishop, 83, of Potter Twp. passed away peacefully, with her family by her side, on September 27, 2018. She was born on November 13, 1934, in Cumberland, MD., a daughter of the late Iva (Dickens) Davis and John Davis. She was a 1952 graduate of Rochester High School, a 1955 graduate of the Providence School of Nursing, a 1972 graduate of Slippery Rock University, where she received her B.S. Degree in Nursing Education, and also a 1990 graduate of Penn State University, where she received her Master’s degree. She retired from the Center School District, where she was the school nurse for many years. Jo Ann loved her profession, adored and cared for family, but also was very active in her community. She served and volunteered with many groups and organizations. And was also an active member of St. Francis Cabrini Church. She is survived by her children, James (Peg) Bishop, Joseph (Wendy) Bishop, Joyce Bromley; 12 grandchildren, Jay (Lindsay) Bishop, Sean Bishop, Jennifer (Joshua) Martin, Tony Lucci, James Bromley, Aaron Bromley, Jeremy Bromley, Shea (Kelli) Bishop, Brandon Bishop, Brittany Bishop, Brian Musolin, Jennifer Shelton; and 12 great-grandchildren. She is also survived by her siblings, John (Emily) Davis, Judy Simon, Donald (Georgia) Davis, Gene (Wilma) Davis and many nieces and nephews. She is preceded in death by her daughter, Jeanette Majors and great granddaughter Emily Magestro Lucci and great-granddaughter, Emma Shelton. Per Jo Ann’s wishes, there will be no visitation. A mass will be held on October 3, 2018 at 5 PM at the St. Francis Cabrini Church, 115 Trinity Dr., Aliquippa, PA 15001. In lieu of flowers, memorial donations may be made to the American Cancer Society or to UPMC Children’s Hospital. The family would like to thank the Drs and Nurses at UPMC Shadyside for their outstanding care, and to the nursing and physical therapy staff of Progressive Home Care, and also to the staff of Mother Teresa Home Hospice.